1. Find the arrow mark and open upwards. 2. Pull the lid backwards until it breaks off the metal casing. 3. Open the metal casing carefully and remove the soft cap. 4. For the new blister packaging, just pull upwards and remove the seal. If the lid did not come off correctly, use a sharp scissors or tool to remove the metal casing. Please be careful with the metal casing and do not hurt yourself in the process. 1. Ensure your hands are clean and wiped dry. 2. Pour the solution out from the vial/blister onto your hands and collect the contact lens. 3. Wash and rinse the contact lens generously using multipurpose solution. 4. 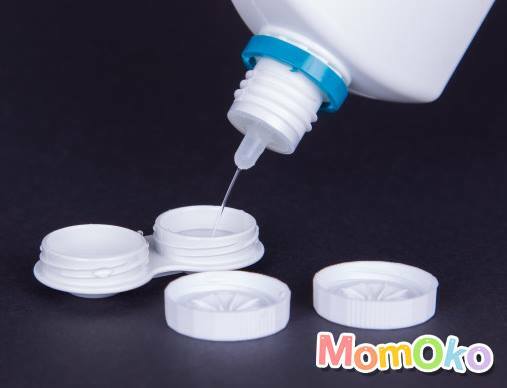 Add a few drops of multipurpose solution onto the contact lens and rub gently to clean the surface. 5. 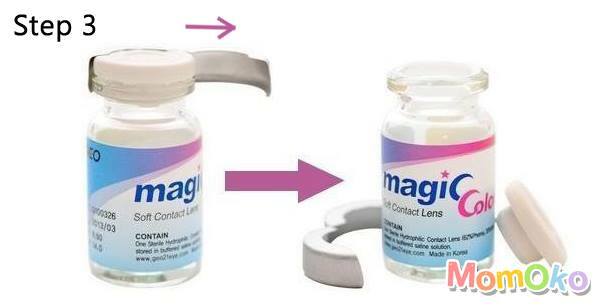 Place contact lenses in a clean lens case filled with multipurpose solution and store up to 6-8 hours before wearing. 6. Always change the multipurpose solution in the lens case after each use or once every week if not used. 7. When storing your contact lenses, kindly soak it fully in the multipurpose solution. 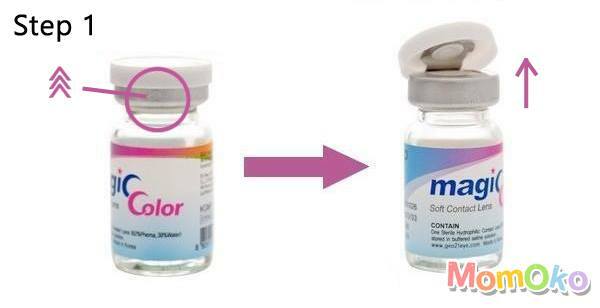 Wearing contact lenses directly from the vial/blister may irritate your eyes, please wash before use. Be gentle when handling your contact lenses as you may damage your contact lenses with your nails. Try to avoid using tissues to dry your hands as you may have micro fibers stuck onto your fingers and contact lenses, making your eyes uncomfortable. Changing new/fresh multipurpose solution in your lens case hydrates your contact lenses, making them much more comfortable to wear. 2. 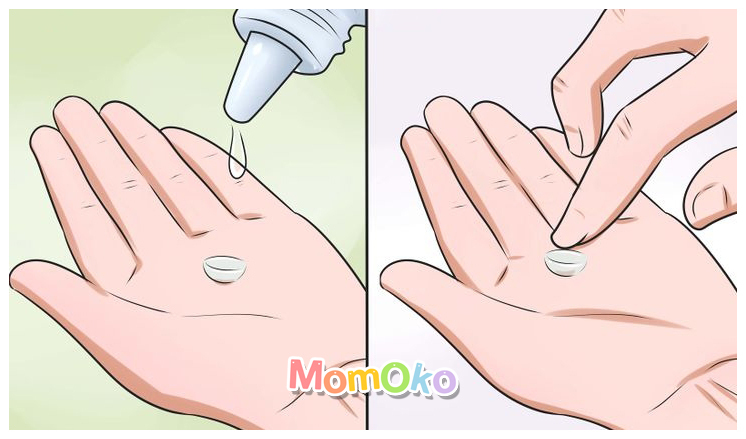 Place one contact lens onto the tip of your finger which you prefer. 3. Gently pull down your lower eyelid (can pull up your upper eyelid as well) with another finger/hand and insert the contact lens into your eye. 4. Remove your finger and slowly move your eye towards the contact lens without blinking. 5. 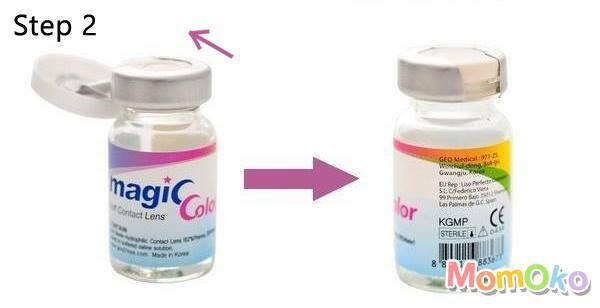 After a while, the contact lens will center itself on your eye. 6. Apply makeup or facial products after that, but be cautious when applying around your eyes. 7. To remove your contact lenses, gently pull down your lower eyelid with your fingers. 9. Gently pinch your contact lenses without touching your eye (if possible) and remove your contact lenses. You may feel uncomfortable if your fingers/contact lenses are not clean enough. If you blink too soon in Step 4, your contact lenses may fall out. You may have trouble wearing if your finger is wet, as the contact lens will stick onto your finger instead of your eye. While removing your contact lenses, please be gentle and avoid using your fingernails as you may damage your contact lenses. 1. 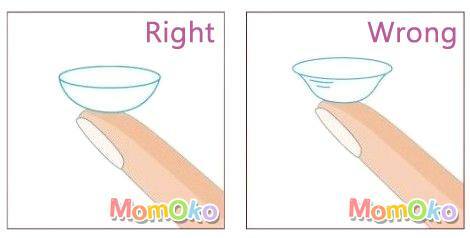 Your contact lenses must be in perfect curve like a bowl when placed on the tip of your finger. 2. If the top curves outwards, your contact lenses are at the wrong side. 3. To correct the sides, just flip it outwards gently with clean fingers so that it curves like a bowl again. 4. Generally, the darker/saturated color side of the contact lenses should not be in contact with your eyes when worn. If you have worn your contact lenses inside out, your contact lenses will tend to shift around when you blink. You will feel slight discomfort if you wear your contact lenses inside out. After flipping to the correct side, remember to wash your contact lenses again before wearing them. Highly recommend Alcon OPTI-FREE® Puremoist® contact lens solution from Alcon OPTI-FREE® brand. Try contact lenses with around 38% water content as they tend to dry out slower. Avoid high water content contact lenses as they tend to take the moisture from your eyes faster. Try contact lenses which are made from silicone hydrogel as they tend to be more breathable. Preservative-free eye drops are also good for immediate eye relief, but do follow the recommended usage. OU: Short for Latin phrase ocular uniter, meaning "both eyes"
MOMOKOLENS does not represent your eye specialist/doctor. 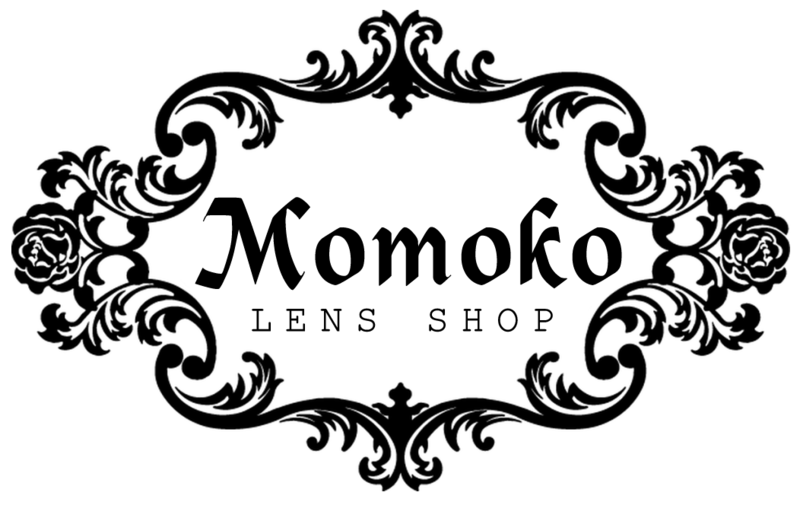 MOMOKOLENS does not own the videos in the links above. 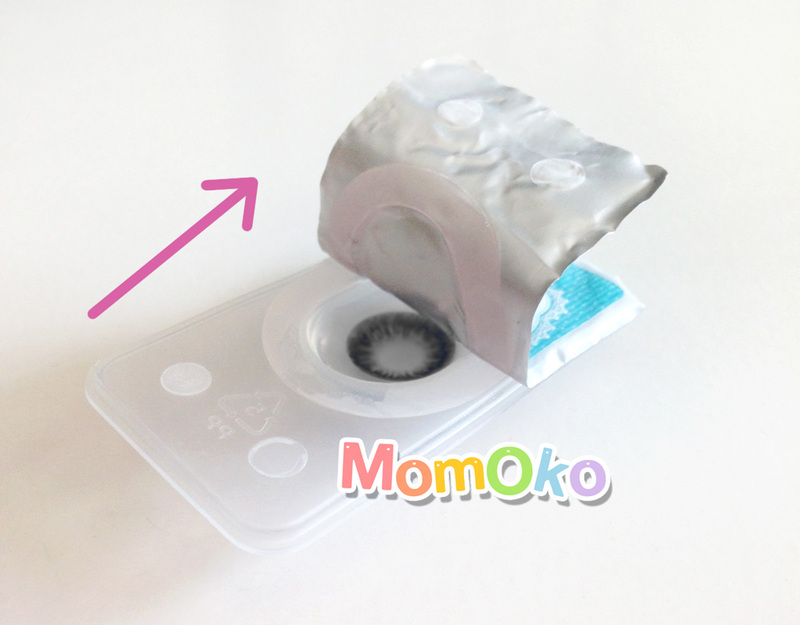 MOMOKOLENS is not in any partnership/collaboration with Alcon OPTI-FREE®. Please read our Terms of Sale before you purchase to prevent unhappy shopping experience.